WOULD YOU DRIVE 2000 MILES FOR A HAIRCUT? The answer was "YES" without a moment of hesitation. We've been trying to get Jamie to shave her head for YEARS!! We have offered this modern day Rapunzel a king's ransom if she would shave her head. She has always resisted our pleadings, saying her husband would divorce her if she shaved her head. She had grown her hair long for her husband, who had a "thing" for long hair. And then, a miracle happened!! Jamie divorced her NOGOODNICK husband and is now single, and the first order of business is "getting rid of all this hair," and a bit of revenge as well. "I can't wait to show my EX my new haircut," she says moments before her 42 inches of silky blonde hair fall to the floor. This modern-day Angel will enjoy the sweet revenge of showing her EX how beautiful she can be without a trace of hair. Would you drive 2,000 miles for a haircut? The swing footage alone was worth the whole trip! HEAVENLY! Jamie is definitely an Angel, and you will see the proof! As if Jamie's haircut wasn't enough, this trip included a "BUCKET LIST" lifetime highlight that we would like to share with everyone- A FLIGHT OVER THE GRAND CANYON!! We flew for over an hour over the canyon, along much of its 277 mile length (Our headphones chatter with facts about the canyon.) The canyon is a MERE 5 million years old, compared to the Earth at 4.5 billion years. The majesty of the canyon is amazing, one of the wonders of the world. The canyon varies in width from just a few miles to 17 miles at its widest point. We fly in a single engine plane just a few hundred feet above the rim of the canyon. There are ten seats, including the pilot's. The views are incredible- no question about it- this is the best way to see the massive canyon!! The mighty Colorado River roars through the canyon, cutting inexorably deeper into the rocks. Colorado means "Color of Red," which signifies the red rocks cut and carried by the river. The red rocks are caused by rust in the iron-rich canyon wall. The North Face is 1300 feet higher in elevation than the South Face, made more beautiful by a blanket of snow. The North Face is inaccesible for most of the year. We hope you enjoyed these pictures as much we we enjoyed making them!! We're including all the footage we shot on the Grand Canyon trip on Jamie's DVD 259, which is NOW AVAILABLE. We think it's a great combination- a Heavenly Haircut for an Angel and a flight to the biggest monument in America. 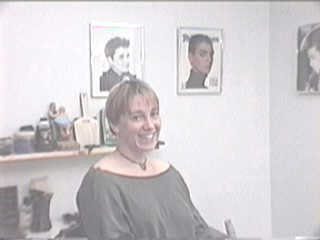 DVD 259 also includes 8 haircuts that are among "THE BEST OF HAIRCUT.NET," with each haircut featured in a rock video. Autumn is the rarest of models- a beautiful young woman who goes from waist length hair to shaved smooth in one evening. Barbie the barber takes Autumn through several stages. First, Autumn's hair is cut to above shoulder length. Barbie then cuts Autumn's hair to chin length. "Not short enough," says Autumn. Barbie then gives Autumn a crewcut, high and tight on the sides, leaving a bit on top. "Very military," says Autumn, and then... Without preamble or warning, Barbie runs the clippers- ZOOM right down the middle!! In the end, Autumn is shaved nice and smooth. Pam comes to the "Little Barber Shop" for a buzz-cut. Here, she shows that she's never had her hair shorter than chin length. Ed Cookingham takes the clippers and makes short work of Pam's buzz-cut, leaving her with just 1/4" of hair. Pam smiles as the clippers buzz off her hair. In a matter of minutes, Pam's hair is piling up on her lap. 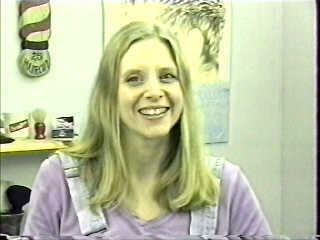 Julie has beautiful shoulder length blonde hair. She wants it short for the summer. Here, she shows off her long hair for the last time before it's buzzed and snipped. We start by buzzing the back to the top of her ears. Then we snip her hair nice and short, going shorter and shorter toward the back. Julie loves her new haircut- nice and cool for the summer. Lauren is from Germany- she's here studying for her college degree. She wants her hair cut "VERRY VERRY SHORT" and the Cookingham's are more than happy to help out, clipping off all of Lauren's hair with the 000 blade.